Exactly one year ago, this pic was taken. 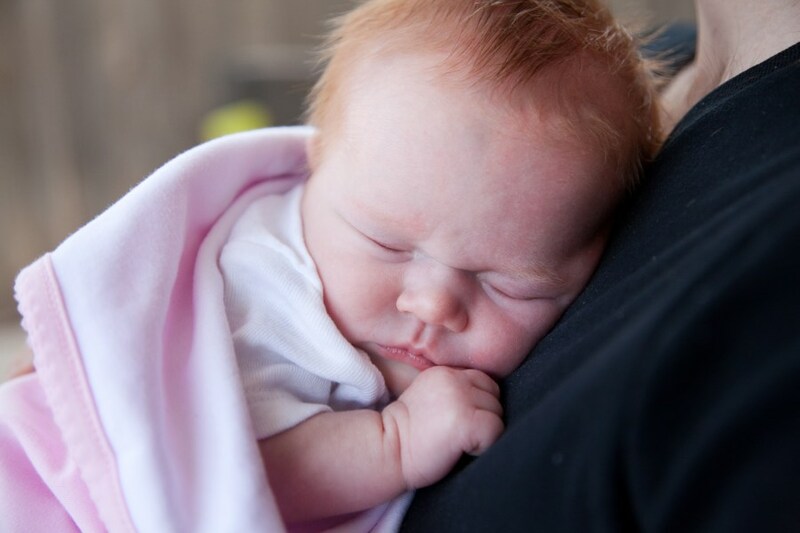 Olive was just 6 days old and we were home, out on our porch, having a glass of wine and marveling at this red headed little girl in our arms. Matt made a birth DAY cake that we had when we got home from the hospital with friends and family to celebrate her actual birth and the only thing that changed this year was the cake and the size of the red head. In this spirit of education, Matt and I contemplated what we wanted Olive to try for her first birthday. She’d had many fruits so I considered a lemon layer cake, strawberry shortcake, something with banana cream. Matt really wanted her to have chocolate for the first time and REALLY GOOD chocolate, at that. 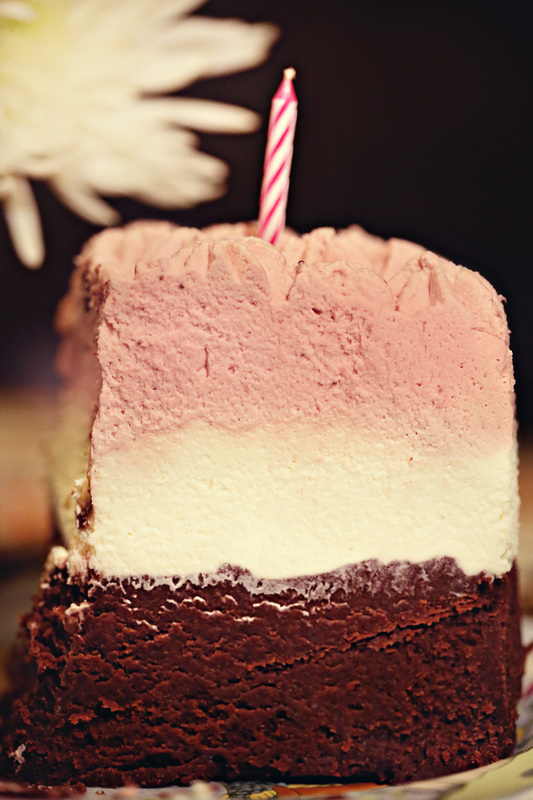 So we combined forces and created a Neapolitan-esque cake with a flourless chocolate cake as the base, a white chocolate mousse in the middle and topped with a thick, strawberry whipped cream. The chocolate cake is by far the best chocolate “cake” I’ve ever had. Taken from the brilliant Dave Lebovitz, it’s nearly like a truffle center, or the best fudge of your life. The white chocolate mousse was taken from Annie’s Eats, which I’d used on a cake for Matt for Valentine’s day this year, which he was crazy about. And then the strawberry whipped cream was just a last minute sort of creation by me for Olive. Because she loves strawberries and I figured if she didn’t like the rest, she’d at least like a third of her cake and we wouldn’t look like complete fools when it came show time. For the bottom layer, Matt baked it in a 9″ round cake pan. We had a hard time getting the cake out (panic moment) and so I crumbled it all up and pressed it tightly into a spring form pan. Then I lined the pan with a couple layers of acetate strips, stacked on top of each other and taped on the outside, to get that tall form for piping in the other two layers. All you do is pipe in the white chocolate mousse on top of the chocolate cake, let it sit in the fridge while you make the whipped cream, and then pipe in the whipped cream and wrap plastic wrap across the top of the tube so it doesn’t dry out and let it sit in the fridge over night, or for an hour in the freezer. This makes it much easier to cut. Place the butter and chocolate in a glass bowl and microwave at 30 second increments, stirring after each, until the chocolate is completely melted, glassy, and incorporated with the butter. In a large bowl, whisk together the eggs and sugar. Gradually whisk in the melted chocolate mixture and continue whisking until thoroughly combined. Pour batter into the prepared pan. Place the pan in a larger roasting pan, and cover the top of the cake pan with foil. Add enough hot water to the baking pan to come halfway up the sides of the cake pan and bake for 1 hour and 15 minutes to 1 hour and 30 minutes until the cake has set. To test, touch the center of the cake lightly with your finger: the surface will be slightly tacky, but your fingers should come away clean. Carefully remove the cake pan from the water bath and place on a cooling rack to cool completely. Cover the pan with plastic wrap and refrigerate for at least 2 hours – up to 3 days. To assemble with the mousse, run a knife around the edges of the cake to loosen the sides. Invert onto a serving plate, wrap in the acetate strips (or wax paper – tape doesn’t stick to parchment) and get on with making the next step. Sprinkle the gelatin over the water in a small bowl and let stand at least 5 minutes to soften. Place the white chocolate in a medium bowl. Bring 1 cup of the cream to a boil in a small saucepan. Remove the pan from the heat, add the gelatin mixture and stir until dissolved. Pour the hot cream mixture over the white chocolate and let stand about 1 minute. Whisk until the mixture is smooth. Cool to room temperature, about 5-8 minutes, stirring occasionally. In the clean bowl of a stand mixer fitted with the whisk attachment, whip the remaining 2 cups of cream at medium speed until it begins to thicken. Increase the speed to high and whip until soft peaks form when the whisk is lifted. Using a whisk, mix one-third of the whipped cream to the white chocolate mixture to lighten it. Fold in the remaining whipped cream gently with a rubber spatula until no streaks remain. Spoon the white chocolate mousse into the pan over the chocolate cake. Smooth the top with an offset spatula. Scrap the jar of jam into a small saucepan over low heat and add about 1/4 cup of water. Heat it just enough so that it incorporates with the water and you break up any lumps with a whisk and the jam is smooth. Transfer it to a bowl and let it cool about 30 minutes, stirring occasionally to help it cool. In a stand mixer with a whisk attachment, stir the cream on medium for a while until it starts to thicken. Then whip on medium high while you gently let the jam stream into the edge of the bowl, careful to not hit the whisk in the middle, until completely incorporated. Whip until a little firmer than soft peaks. At this point, I added a little red food coloring (just a few drops) to make it more pink and folded it in with a spatula until fully incorporated. Do what you will with that. I just wanted it to be pink to truly look Neapolitan. Transfer cream to a piping bag fitted with a large star tip and pipe, pipe, pipe until you can’t pipe any more. Have fun with it. Make zigzags and peaks and star flowers – whatever you want. Just fill in all the gaps and sprinkle the top with extra crunchy sugar for effect. This entry was posted in Baked Goods, Cooking Tips, Desserts, Eggs are Awesome, Musings, Weekend Fare and tagged birthday cake, chocolate, chocolate cake, Dave Lebovitz, mousse, strawberry cream, whipped cream, white chocolate. Bookmark the permalink. It can only be called “decadence” or “indulgence” — by far the most delicious birthday cake I’ve ever experienced!